Projector mobiles! The latest technology creeping into the market step by step - inbuilt projector in a mobile. Spice and G'Five entered the projector phone market quite early, they were the first in India. 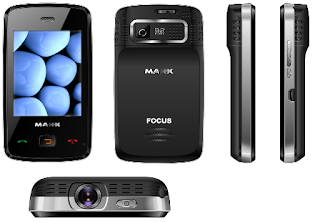 Now MAXX mobiles have launched their projector mobile. Named as MAXX Focus, it stands very much advanced from its pioneers. It has a Full Touch Screen, Two sockets for the sim - A Dual Sim, and inbuilt projector. Not only these special features, but it has a decent 5MP camera and 2.8 inch displays, runs on a 208MHz processor. It includes the basic features - bluetooth, wireless radio, video and audio player, USB support and a memory slot. These are more-than-enough features that can be expected from a mobile priced at 6999 INR. Java Games and Applications comes pre-loaded in the handset.